I have been doing a bunch of stuff around disaster recovery (DR) recently, and my storage of choice at both the production site and the recovery site has been VSAN, VMware Virtual SAN. I have already done a number of tests already with products like vCenter Server, vCenter Operations Manager and NSX, our network virtualization product. Next up was VCO, our vCenter Orchestrator product. I set up vSphere Replication for my vCO servers (I deployed them in a HA configuration) and their associated SQL DB VM on Friday, but when I got in Monday morning, I could not log onto my vCenter. The problem was that my vCenter was running on VSAN (a bit of a chicken and egg type situation), so how do I troubleshoot this situation without my vCenter. And what was the actual problem? Was it a VSAN issue? This is what had to be done to resolve it. First things first, I had to figure out if I had a VSAN/storage issue or a vCenter server issue. I logged onto the ESXi host that was running the vCenter VM. On looking at the error messages, I could see that vCenter had problems accessing it disks. This meant that it was time to turn our attention to VSAN. The command reported a whole bunch of components that were inaccessible, just like we’d observed in the UI. We tried the –refresh_state option to this command, just to see if it could give VSAN a nudge to figure out where its components were (in case we had a massive APD (all paths down) event or something similar over the weekend). We didn’t think it would make much difference, and we were correct. Now that the cluster was recreated on the new vCenter, I went to the VSAN General tab, and under Network status, we saw the dreaded Misconfiguration detected message. So that explains why so many components were absent. The hosts in the cluster had difficulty in communicating with each other, and in fact the cluster had partitioned. Using esxcli vsan cluster list on the ESXi hosts, we saw that in fact none of the hosts were able to communicate, and that there was only a single host in each partition. OK – time to figure out why the hosts were not able to communicate. The strange is that nothing had changed (to my knowledge) over the weekend. Our ops guys confirmed that there were no infrastructure changes either. 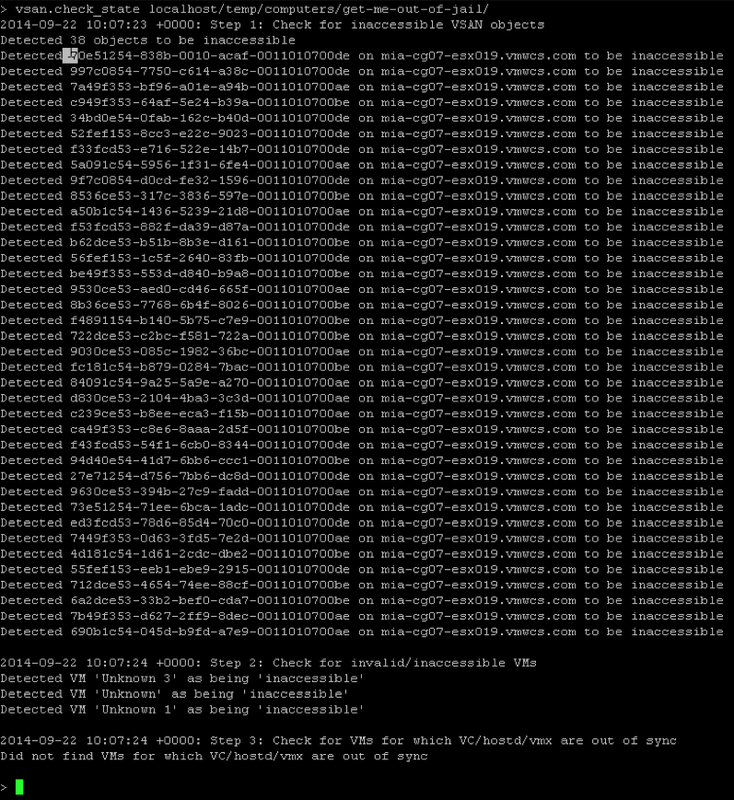 So we started off by pinging each VSAN traffic VMkernel port on all the hosts using the ping -I command – all were good and responding. So the next possible cause seemed to be that this was a multicast issue. I then started to use some of the very useful multicast troubleshooting commands referenced by Christian Dickmann in his 2014 VMworld presentation (STO3098). I was then in a position to connect to my original vCenter server, disconnect the hosts from my temporary vCenter server and add them back to the original vCenter server. All was good once again. So what was the root cause? We’re not sure. The environment was running like this for some time, and the clusters didn’t appear to have a problem. However we can only assume that having the same multicast addresses across both clusters on the same network led to the issue at hand. Once we separated the clusters to have their own unique multicast addresses, we were good to go. Kudos again to my buddy, Paudie O’Riordan, for working with me on this issue. Hopefully you will find those command useful when you have to troubleshoot VSAN network issues. I would also recommend watching Christian’s STO3098 session from VMworld for additional troubleshooting tips. 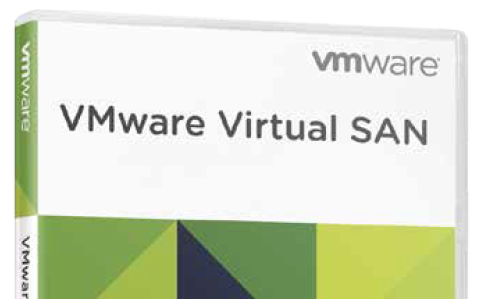 If you are interested in getting started with VSAN, the Essential VSAN book is now available via both Amazon and Pearsons. What happens when the other cluster changes its multi cast address another collision occurs? Why not use VLANs? Easy for me to say, I guess Ive got Cisco Ucs, where the server admin controls VLANs. Indeed – that would have solved it. The issue is that we deployed multiple clusters on the same VLAN, and forgot to make the multicast change. Once we made the change so that each cluster had its own unique multicast addresses, we were good to go. Maybe I’m confused but in your book, I remember it mentioning that if running multiple VSAN clusters, you have to turn on IGMP snooping and setup multiple multicast groups so that the multicast traffic is separated. Is the problem you had here along the same lines as what I’m talking about? Exactly, except we forgot to set the unique multicast group addresses per cluster. One last question…when you moved the ESXi hosts into the new cluster (non-VSAN enabled) for testing purposes..did you enable VSAN automatic disk mode or manual? We had it in manual, but I don’t believe this would matter. 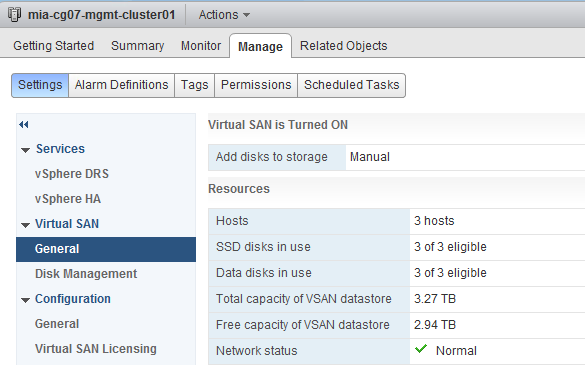 The hosts remain part of a VSAN Cluster, so the cluster simply reforms without anything needing to be done at the disk level. Would be great having a comparison between both if this was actually implemented in the future.